A $198,000 U.S. Department of Agriculture (USDA)-sponsored Conservation Innovation Grant will support ongoing University of Georgia research on cover crops and the effects of those crops on water quality and availability for row crop production. The grant, which is administered through the USDA Natural Resources Conservation Service, enables scientists from the UGA College of Agricultural and Environmental Sciences to join Clemson University in collaborating on this research. Wes Porter, UGA Cooperative Extension irrigation specialist, and George Vellidis, CAES precision agriculture expert, conduct the cover crop research on the university’s Tifton campus. The research started on September 21, 2017, and will continue through July 2020. “We want to demonstrate these techniques at an Extension site to show producers how implementing these methods can help in a production scenario. If we implement a thorough cover crop strategy and manage it properly, we can reduce water consumption and improve water quality,” Porter said. Cover crops are used as part of a conservation tillage system that builds soil’s organic matter. They are planted during fields’ fallow or dormant times. 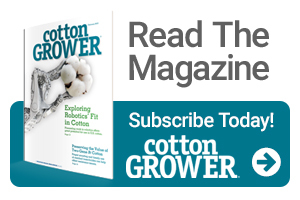 After the grower harvests a row crop – such as cotton, peanuts, corn or soybeans – the cover crop is planted and covers the field during the winter. The grower then kills the cover crop prior to planting the row crop the following spring. Row crop planting requires limited tillage. This reduces the amount of soil disturbed in the field, which leads to increased water infiltration and decreased runoff. Farmers use cover crops in the winter to preserve soil moisture, prevent erosion, increase soil’s organic matter and prevent nutrients from leaching below the root zone. There are a wide range of cover crops grown in Georgia, including rye, wheat, oats and crimson clover. UGA is researching wheat and rye cover crops because of their deep root systems, which better hold water and nutrients below the surface. For the past three years, the cover crop being researched was grown following corn or soybeans. The researchers will plant corn again this spring, but Porter is open to rotating cotton or peanuts into the field in the future. Clint Thompson is a news editor with the University of Georgia College of Agricultural and Environmental Sciences, based in Tifton. See all author stories here.